One of the best things about cooking on such a tight budget for the Tuesday night dinners is that it has forced me to experiment with a bunch of bread recipes. Before this catering gig I’d never made bread myself, but now I rather enjoy it. With this recipe it’s easy enough to make anytime. Since it only requires an hour to rise, you’ll have fresh naan in no time. In a large bowl, combine the yeast, sugar, and water. Stir to dissolve then let sit for a few minutes or until it’s frothy on top. Then stir in the oil, yogurt, and eggs until evenly combined. Add 1 cup of flour and salt to the wet ingredients and stir until well combined. Continue adding a half cup of flour at a time until you can no longer mix the dough with a spoon. Turn the ball of dough out onto a well floured surface and knead the ball of dough for about 3 minutes, adding flour as necessary to keep the dough from sticking. The dough should be smooth and very soft but not sticky. Cover the dough with the bowl and let rise until double in size (about 1 hour). After it rises, gently flatten the dough and cut into 20 pieces. Shape each piece into a ball. Heat a large, heavy bottomed skillet over medium heat and spray lightly with non-stick spray. Working with one or two balls at a time (depending on the size of your pan), roll each one out until it’s about 1/4″ thick. Place the rolled out dough in the pan and cook until large bubbles begin to form on the surface. Flip the dough over and cook the other side until bubbles turn golden brown. Serve plain or brush with melted butter and sprinkled with salt, garlic, and/or hearbs. This needs to happen in a huge way. 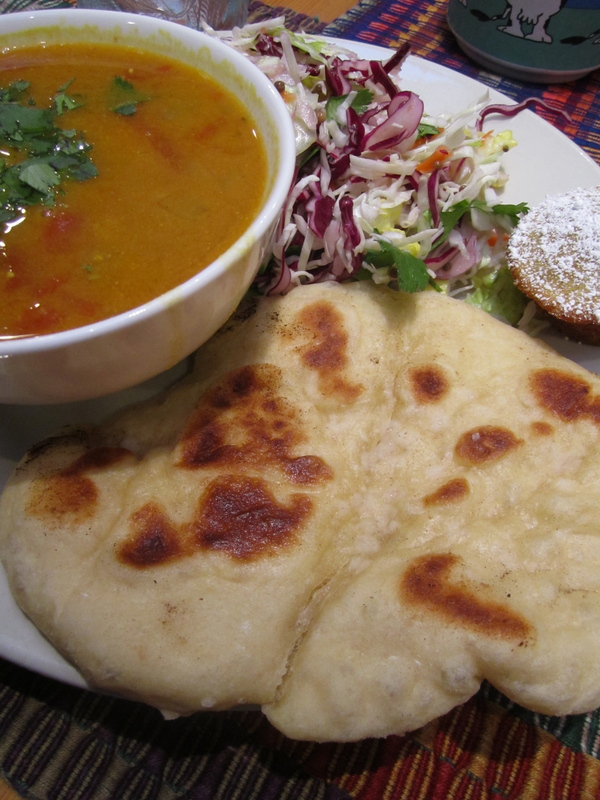 I have this dhal recipe I’ve been scared to try, but with Naan it would be life changing. Mmm sounds like a winning combination! Send me the dhal recipe!